I am loving on juvaflex vitality right now. This little oil sat unloved in my cabinet for a while. I had planned on coming up with a regimen to use it and kept putting it off. But when I realized I was going to do the 5 day cleanse, I decided to use this to help prep my body. It is a fantastic oil for supporting the liver. And you all know how much I love the liver. Geranium - Supports the liver but also the kidneys and pancreas. Helichrysum - Apparently Gary Young's favorite oil and amazing for liver support and circulatory support. I used this in a capsule for about 10 days morning and night. I put 2-3 drops in a capsule with citrus fresh vitality and coconut oil. I definitely felt it working, but only after the 4th day. You need to stick with it. If there is one key tip I can leave you with, it is being consistent with your health regimens. You do not need to do ALL. THE. THINGS. In fact you shouldn't. Do Less Better. But whatever it is that you decide to do, stick with it. Male a plan, have a routine, and follow through. The reason this is so important is because many times with health and well-being, changes do not happen right away. Since in this post we are talking oils, I will give an example. You might have occasional head tension and you decide to rub some peppermint on your temples. You may get instant relief. But that is just an acute issue you are delaing with. Things like weight management and maintenance, supporting internal organs, emotions and moods are best dealt with on a longer term and consistently. So if you are wanting to make changes to improve an aspect of your health, you are going to want to commit to doing something consistently over several weeks in order to start to see improvements. Just like I mentioned that some thing take longer, sometimes your results will be more subtle as well. That is actually a nice thing about this oil, the subtlety. At least it was for me. I could feel changes in my body, see and smell changes in the bathroom :).. I had minor minor aches in my muscles, just enough to show me it was working, and I had a bit more energy. I loved that using this oil, for me, was something that I could do without feeling like I had to stay close to home. Many times with cleanses and such, it is recommended to stay close to a bathroom. That is just not always convenient. This oil is a great addition to a longer, slower process of detoxing and supporting your liver. 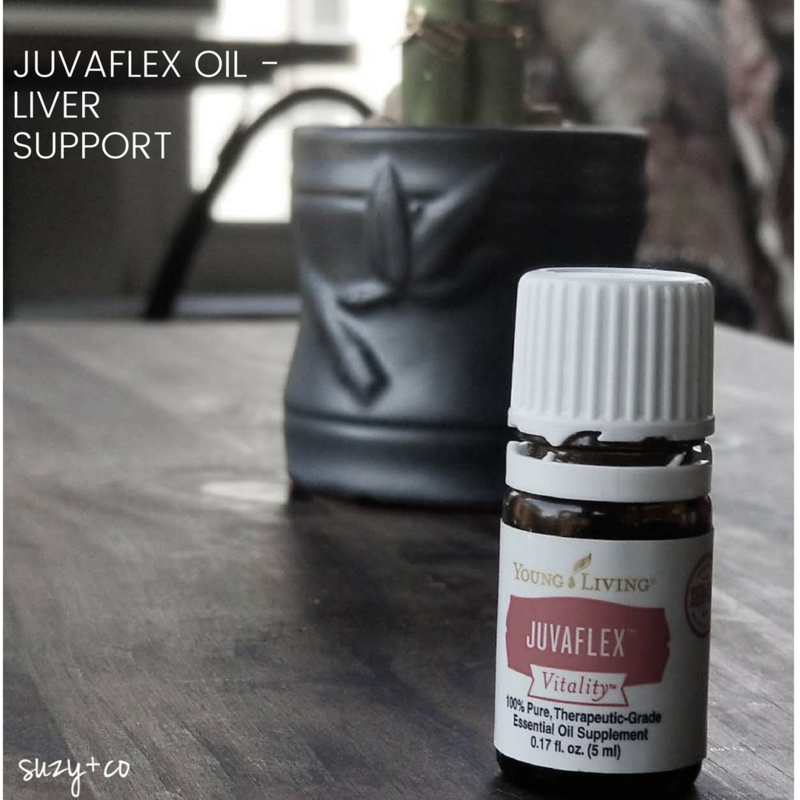 If you are wanting to help your liver detox but are not ready for a full blown cleanse, juvaflex may be a great one to try. Simplify your wellbeing and make your health and wellness a priority by signing up for the suzy+co newsletter.